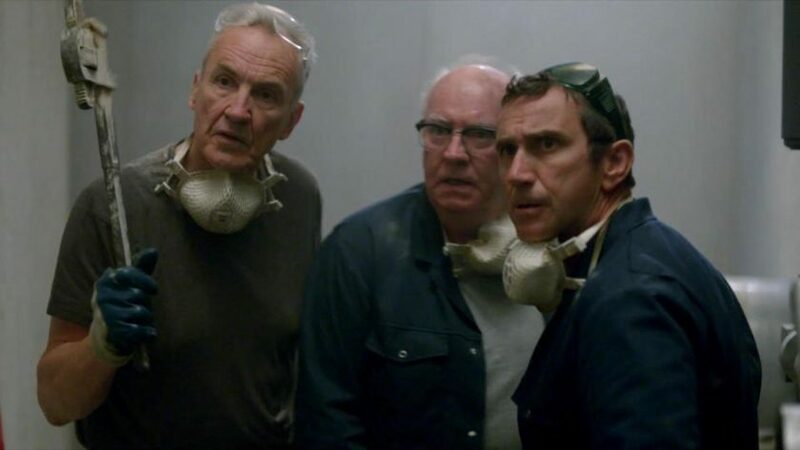 You will probably remember the real life Hatton Garden job two years ago, when a group of veteran villains broke into a bank vault over the Easter weekend with the object of funding their retirement to the Costa Del So from the £14 million heist. Because of their ages – most of them were in their sixties and seventies – the press had a field day with phrases like “pensioner gang”, “diamond wheezers” and “Dad’s army. The gang members were finally caught because, according to the police, they made old fashioned analogue mistakes in a digital world. Great material for a good, classic comedy then in the Ealing Films tradition. In terms of casting the film has struck a goldmine of first class, reliable British veteran actors – Larry Lamb indeed played a similar folk hero gangster role as a Great Train Robber in “Buster” in 1988 – with the engaging Matthew Goode as the younger “mystery man” behind the robbery – the one who was never identified in real life and got away. It’s a terrific story, which is a natural for a comedy about veteran crooks. “The Lavender Hill Mob” meets “Dad’s Army”. Or alternatively it could have been played as a tense thriller. Unfortunately it is largely lacking in both laughs and tension. The script is just dull and rarely funny, as though the writers were scared to make ageist jokes about failing memories, weak bladders and incompetence with mobile phones in case they fell foul of political correctness. It’s also weighed down with far too much voice over, while the direction is uninspired and stodgy. There is for example a sequence of the gang breaking through the bank wall with a drill, which seems to go on forever with not a single line of sparkling dialogue or comic character insight to lighten it, while the rich opportunities offered by the story for conflict between the old fashioned ways of the gang and the high tech the police claim they used to catch them are hardly touched on. 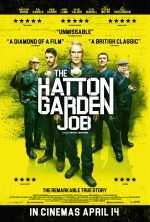 The addition of a subplot involving Hungarian mobsters does nothing to liven the mix and Joely Richardson is unconvincing as the mob mistress. She should have learned from Kate Winslett’s efforts at a Russian mobster madam in “Triple 9” that English actresses on the whole do not cast well as East European gangsters. The actors do their best but they have very thin material and nearly zero in the way of interesting characterisation to work with. Another version of this story is rumoured to be in the pipeline with Michael Caine and Ray Winstone’s names being bandied about. I hope it fares better. There’s a real comedy thriller gem waiting to be made from this story. Sadly this isn’t it.